“Silver Screen Reflections” remembers boxing legend Muhammad Ali, who died at the age of 74 on Friday. In May 1977, a biographical motion picture of one of the nation’s greatest athletes was released to cinema venues all over the country. 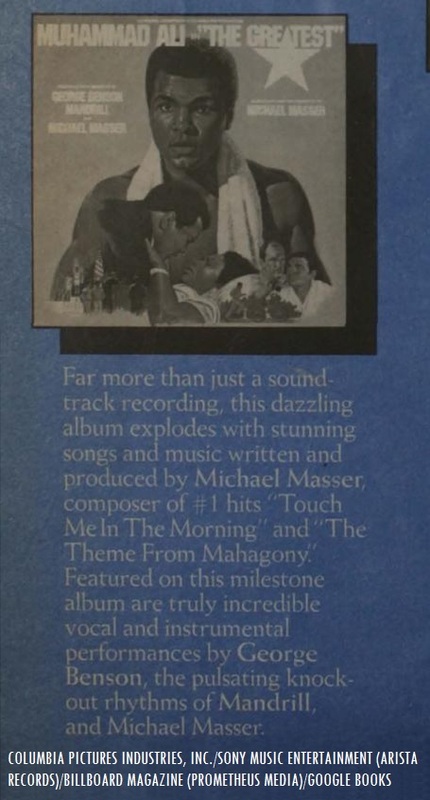 1977 Arista Records promotional ad in Billboard Magazine for the soundtrack album to “The Greatest.” The title song to the film, sung by George Benson was #24 on Billboard’s Hot 100 chart (Oct. 8, 1977). Adapted from his 1975 book, “The Greatest: My Own Story,” Muhammad Ali portrayed himself in the motion picture adaptation of his autobiography. The film was directed by Tom Gries (who died before The Greatest” was released to cinemas) and Monte Hellman. In addition to the reenacted scenes that featured the heavyweight boxing champion, footage from Ali’s matches were included in the film, including the 1974 “Rumble in the Jungle” match against competing boxing champion George Foreman. In addition to Ali, his brother Rahman Ali made a cameo appearance as himself in the film, along with photographer and biographer Howard Bingham, sports broadcast announcer Don Dunphy and boxing event promoter Harold Conrad. Actors who appeared alongside the boxing legend in “The Greatest” were James Earl Jones, Paul Winfield, Ernest Borgnine, Robert Duvall, Philip (Chip) McAllister (who portrayed an 18 year-old Ali, then-known as Cassius Clay), Roger E. Mosley, Dina Merrill, John Marley and Ben Johnson. Sony’s ad-supported “Crackle” video streaming service is offering “The Greatest,” along with many other select Columbia features for free. Gries and Hellman’s film adaptation of Ali’s autobiography is an interesting look at the champion beyond the boxing ring. Silver Screen Reflections remembers Muhammad Ali (1942-2016).